Although German, Japan, and the USA were the only major camera manufacturers in the late 20th century, the early part of the century had companies in France, Italy, and other European nations actively designing and producing camera systems for their citizens. Optique et Précision de Levallois (OPL) was founded in 1923 to produce optical instruments for aviation, marine, and military purposes. 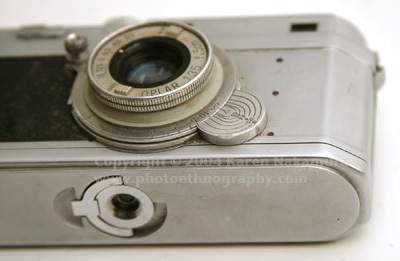 They set about in 1938 to make a camera, based roughly on the wildly popular Leica rangefinder. The war and German occupation intervened with those plans. The Foca finally emerged in 1945, after the war, as the PF series. 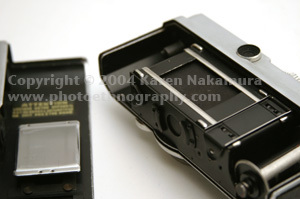 PF stands for petit format or small format (35mm). Confusingly, PF Focas do not have standard model numbers, instead using a series of * stars. * (PF1) 16,001-21,200 1946-1947 No rangefinder. Screwmount lens. 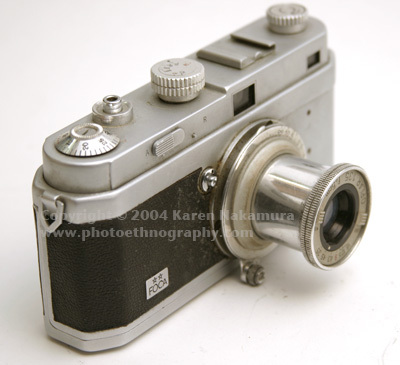 * (PF1 Standard) 1948-1962 No rangefinder. Screwmount lens. Star engraved. ** (PF2) 10,001-15,999 1945.10 - 1946 First model released. Rangefinder coupled screwmount lens. Shutter 1/20 to 1/500. ** (PF2bis) 1947-1957 Shutter speed to 1/1000. Rangefinder coupled screwmount lens. Stars are engraved. 1957- Hi / Lo shutter speed dials (separate). The early 1947-51 are very few in number. With the PF2 series, the rangefinder only couples to the 50mm normal lens. There were interchangeable PF2 lenses, but I'm not sure how you would focus them. My original lens was quite difficult to remove, it took a good bit of strength. If I wasn't convinced that it would actually come off, I wouldn't have tried to do it. 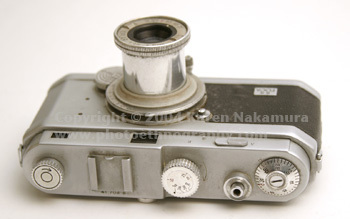 There are also a series of bayonet mount cameras and lenses, I'm trying to find more information about them. Optique et Précision de Levallois (OPL) was founded in 1923 to produce optical instruments for aviation, marine, and military purposes. 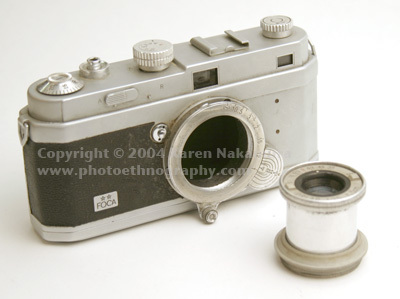 They set about in 1938 to make a camera, based roughly on the wildly popular Leica rangefinder. The war and German occupation intervened with those plans, but by 1942 the Germans encourage the release of the the FOCA rangefinder system. 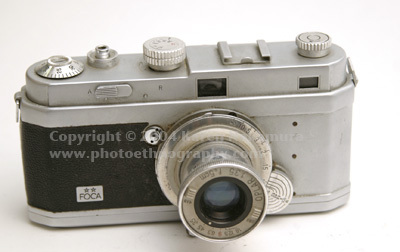 They produced cameras well up to the late 1950s, releasing the SLR FocaFlex in 1959, which featured innovative TTL metering. Last modified: Thursday, 11-Mar-2010 01:00:22 EST , [an error occurred while processing this directive] .